We had a rare treat this weekend… a day off! Actually, we technically had two days off (a normal weekend… imagine that! ), but Debbie and I had to do some prep for class today, so maybe we’ll settle at a day and a half. In celebration of our vacation, we planned a trip into Lima on Saturday. 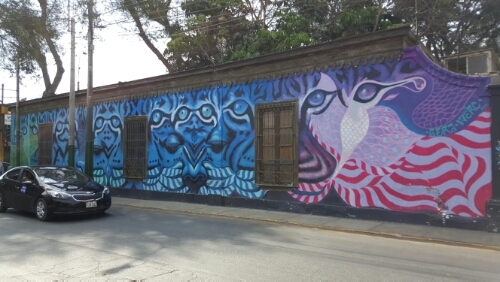 Debbie and Julie’s favorite part of town is the Barranco district, described by them as “hipster Lima”. It’s the part of the city where a lot of artists and musicians live, and you can definitely feel the artsy vibe (plus there are murals everywhere). 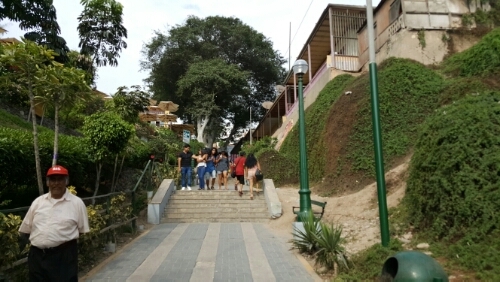 There is also a famous 19th century bridge, the Puente de los Suspiros (Bridge of Sighs), that crosses a ravine (“Barranco” = ravine) turned walkway to the beach (called the Bajada de los Baños). As you might imagine, this part of the district is very popular, especially during the summer months as people are actually going to the beach. 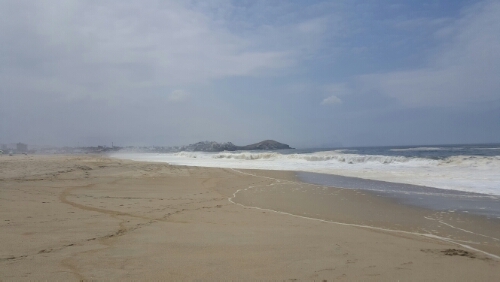 The beaches in the area are PACKED, and the waves are decent so there are also a lot of surfers (fun fact: the “shores of Peru” are given a shout out in the Beach Boys song, Surfin’ Safari). I’m getting a little ahead of myself though… As I was saying, we decided to go into Lima, but not until around noon so that we could sleep in!! I got a whole 10 hours of sleep! Plus I had time to accomplish things before we left. 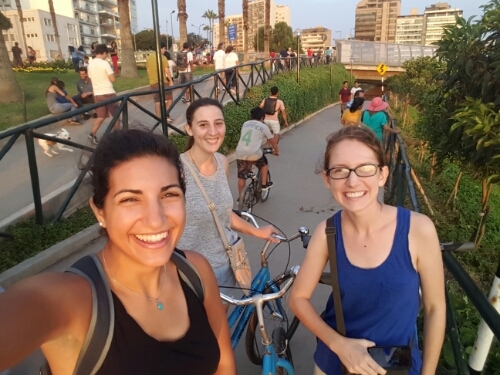 It takes about an hour to get into that part of Lima from where we are, and after we got to Barranco, we ate lunch at a Mexican restaurant and did the walk down to the beach. The way down is nice and scenic, and the way up is nice and steep. As a reward for our good walk, we got some gelato and watched some spectacle that was going on in the main plaza. No one in our group seemed to know exactly what it was, but there were a bunch of groups dressed in traditional attire (someone said they were from the highlands but who knows) and doing dances. I wish I had any idea of what was going on/that we were a little closer, but it was still cool to see everyone’s outfits. Our last stop of the day was Larcomar, a shopping mall in the Miraflores district of Lima. We rented bikes, per my request, because I’m working on a bucket list goal of biking on every continent (shout out to Kristine who came up with the idea for herself and allowed it to be stolen by me). I only have Oceania/Australia and Antarctica left, and don’t even ask me how I’m going to accomplish that last one. 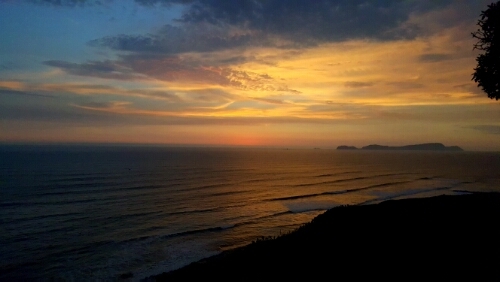 We biked down the road that runs along the cliffs to “Parque del Amor” (Love Park) and then paused and found a good spot to watch the sunset. 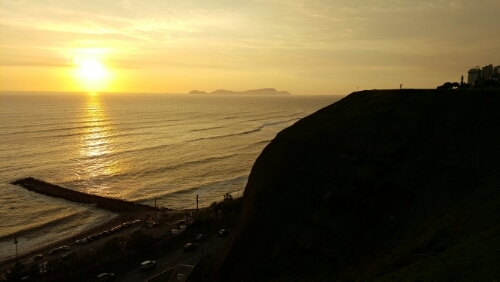 The sunsets here are pretty amazing, and there are people lined up along all the good lookout spots on the cliffs (Miraflores is basically city, cliffs, beach, ocean) to enjoy the view. You can’t go wrong when you end a day by watching an awesome sunset! Afterwards, we headed back to the mall to return the bikes and then to the car to make the trek home. By the time we got back, I was wiped out. Good thing too because our neighbors kept up their perfect record of Saturday night parties, but I was so tired that I fell asleep without a problem. Today was the usual Sunday schedule – church, grocery shopping, some relaxation time, and class planning with Debbie. As much as I’ve enjoyed teaching this class, I also won’t be too upset when we don’t have to prep for it anymore! Teaching is a lot of work! The last week of summer school starts tomorrow, so we only have 2 more classes to finish off the robot and city projects. We can do it! I think. I hope. ​This weekend has been completely packed. I didn’t get a chance to write yesterday because it was crazy from morning to night… we didn’t get home until after 11PM! I, of course, was a total mess and couldn’t keep my eyes open, so I decided it was better to just go to sleep rather than attempt to write something (that inevitably would have been incoherent). Yesterday was the team’s last day, aka my last day of coffee duty! I rolled out of bed just in time to get the coffee started at 6AM, took a quick shower, ran back to the kitchen to make breakfast, etc. etc. etc. until after worship when I took a 45 minute nap because I knew there was no chance of me making it through the day without one. The team was ready to go around 11:30AM, and that’s when our adventure started. Most (if not all) of the flights to the US from Lima leave in the middle of the night, so we had the entire day to spend sightseeing in the city. Our first stop was for lunch, at a hotel in Punta Negra where Jim and Tony used to live before the EA buildings were complete enough to move in. Tony ordered a bunch of different dishes so that people could try a few things. I had some arroz chaufa (basically fried rice), lomo saltado (beef stir fry), sweet potato slices (potatoes are very popular here), and a piece of corn tamale (ground up corn and some other things all mushed into a rectangle). The sweet potatoes and tamale weren’t my favorite things… The potatoes had a confusing bitter taste to them, and the tamale wasn’t my favorite texture. It was nice to have a chance to try some different things without committing to a whole plate though! Plaza San Martín. The statue is of José de San Martín, Peru’s liberator. The beach at the hotel was also nice. There’s no beach access without going through one of the hotels/restaurants in the strip, so that makes it into a kind of private beach. It wasn’t very crowded there, partly because of the “private-ish beach” thing, and partly because the waves are huge which makes it a less desirable location for people who want to go in the water. I had no interest in touching the sand or the water though, so I was happy to have less people and get to see the big waves (from afar). 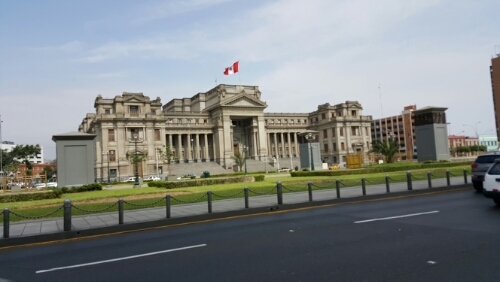 The Palace of Justice, home of Peru’s supreme court. The rest of the day was filled with sightseeing! 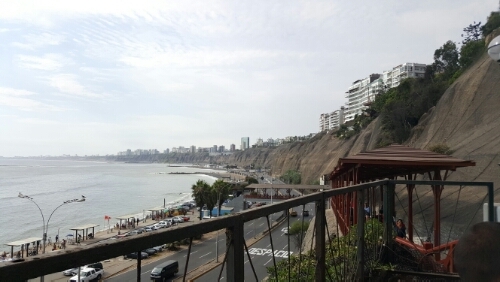 We drove into central Lima, checked out some of the historic stuff I saw a couple weeks ago (though all access to the plaza was blocked, so we didn’t get to go back there to see the President’s house, etc), and then drove up the coast to an overlook where you can see the city. The coast is awesome because there are these huge cliffs between the city and the beaches. They’re probably a pain to walk up and down and to deal with (and they’re all covered in netting because I’m sure they have rock slides all the time), but they’re definitely beautiful. The overlook was one of my favorite parts of the day because I don’t think I fully appreciated the size of Lima before seeing it from that vantage point. When I say that the city stretched as far as the eye can see, I am not exaggerating. In every direction, the buildings just looked like they continued on forever. 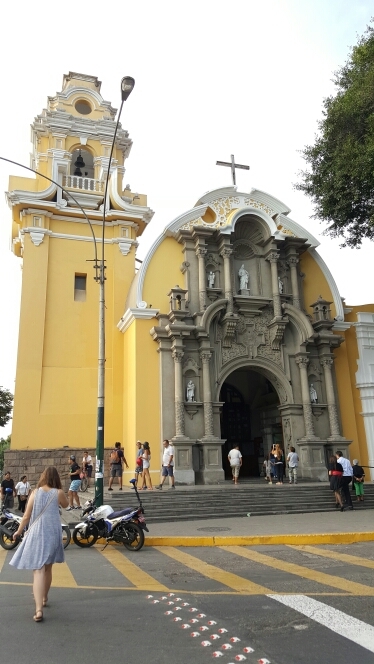 There’s also a massive statue of Jesus at the top (Cristo del Pacifico), and you can see him standing on top of that mountain from miles and miles away. Buildings everywhere. If I had turned my camera to the right, you would see more of the same type of congestion. The last part of the day before dinner and heading to the airport was a stop at the Inca Market, an artisan market that’s great for souvenirs. We split into groups, and I enjoyed walking around, seeing everything that the stores had to offer, and practicing my Spanish. A lot of people spoke enough English to say prices and such, but they were definitely happy when they realized that they could speak Spanish to us instead! And I even spoke a little! And no one looked at me like I was speaking gibberish! Maybe they were just being polite, but we’re going to go with “I nailed it” instead. 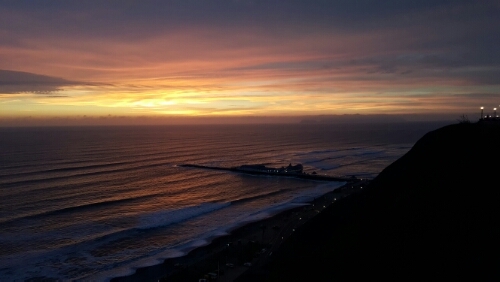 Lima on one side of the mountain, and this on the other side. Dinner, the drive to the airport, and the drive back to EA after the airport were completely exhausting. I was falling asleep in the van all the way home. I even started doing that thing where someone talks to you and you can understand them, but when you go to answer, you’re way too tired to put words together so it just sounds like gobbledygook. Needless to say, the discoteca is going to have to try harder if it wants to keep me awake because I’ve been having some exhausting Saturdays recently! How cool is that sunset?!?! Today was one of those days where you have a lot to do, make a to do list, work on things all day, and realize that you actually completed zero of the things on your list, despite the fact that you were running around all day. I don’t even know how I filled the hours today, but I blinked, and the day was close to over. I spent a decent amount of time doing laundry, cleaning my room, and moving from the room I’m in right now into Debbie’s room because Kait, the last missionary, is coming back this week, and I was in her room. ​We had a big errand day today, and it was one of those unfortunate errand days where everything goes a little (or a lot) more slowly than you’re expecting, it becomes impossible to finish all the tasks on your list, and you go home feeling slightly defeated because you know you’re going to have to do it again. Since it’s the weekend, we “slept in” and left at 9AM. We were headed to central Lima, which I hadn’t been to before. When we went into Lima for church last weekend, we were still a bit on the fringes of the city. Our first stop was to get fabric for curtains, and apparently one of the only places to buy bulk fabric like what we were looking for is in a semi-shady part of central Lima. Eddy (one of the Esperanza de Ana staff who does a lot of the driving), his daughter (who’s 2 years old and is one of the most talented escapees in Julie’s class), Julie, Debbie, and I loaded into the EA van, and off we went. A car filled with free floating mini-pots. I can only imagine how fun it probably was to load and unload each of those individually, definitely through the windows. Reading the paper because what else would you do at a time like this? I want you to keep in mind the fact that I previously declared that I never wanted to drive in Peru because it’s terrifying… and now take whatever I thought I knew about driving here, multiply it by 1000 terrifying points, and you have the actual central Lima driving experience. I haven’t seen such a lack of order on the road since I was in China (crossing the street, in parts of Shanghai and Beijing at least, equals taking your life in your hands). I’m going to try to explain, but there’s literally no chance it does the experience justice. There are cars everywhere. No one pays any attention the lines on the road (assuming they even exist). Pedestrians boldly step out into traffic and act like the hand they’re holding up to tell cars to stop is creating a force field that will keep them from getting hit. Some intersections have literally no indication of how drivers are supposed to decide who should go (no traffic lights, stop signs, etc), so everyone tries to go at once. It’s like everyone is constantly playing a game of chicken: one driver says, “I’m going to put my car there,” and another driver says, “no, that’s where I’m going,” and then they both floor the gas pedal and head for that spot until someone decides that today is not the day to get into a car accident and backs down. Some drivers decide that it’s a great time to catch up on the happenings and read the newspaper while sitting in traffic. Everyone is constantly honking, as if that’s going to make all of the traffic ahead of them magically disappear. Our one cab driver definitely had some road rage issues, and at one point he started yelling out the window at the honking truck behind us, got out to yell some more, and came back to grab his baseball bat (which he probably had in the car because he had a softball game later… NOT. Clearly this isn’t the first time he’s felt the “need” to use it). Luckily, he just waved it around, got back into the car, and kept driving like a maniac. The fabric store. You can only see about 1/3 of it here… Yeah, that’s a lot of fabric. We somehow made it to the fabric store alive… at about 12:15PM (I’ll do the math for you: 3:15 after leaving home for what should be maybe an hour and a half trip). We wandered around and asked a bunch of fabric stores if they had what we needed before getting directed to a shop through some random hole-in-the-wall hallway. Debbie got what she needed for the curtains, and I bought some fabric too for an undetermined future project. By the time the fabric expedition was complete, it was around 2PM, and we were all starving. We located the closest quick and reasonably-priced place to eat and promptly stuffed our faces. I got “arroz chaufa con pollo” which is essentially chicken fried rice. I think it was really good, but I can’t be sure because my brain wasn’t fully functioning at that point. Julie, me, and Debbie in the Plaza Mayor in front of the cathedral. 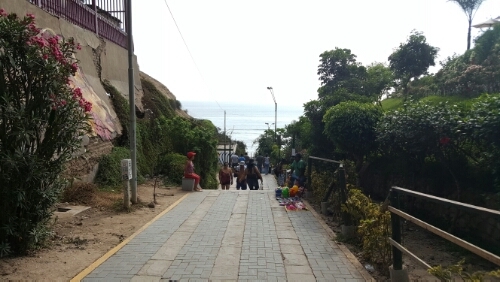 Before loading back into the car, we walked around the historic center of Lima. There’s some pretty architecture and an epic central plaza (Plaza Mayor de Lima) that is surrounded by some government buildings including Lima’s city hall (Palacio Municipal de Lima) and the Palacio de Gobierno del Perú (where the president lives – basically the White House of Peru), and the Cathedral of Lima. Today I found myself in object form, and I am a toilet. At 4:00PM, we had officially completed one thing on the to-do list. Ouch. Thankfully, most of the other things got cut. On the way back to EA, we stopped at Maestro (Peruvian Home Depot) to get some supplies for maintenance and a few upcoming projects, and after that, the only stop left on the list was home. By 7:45PM, we were back, and I was exhausted. Now, it’s almost midnight and the neighbors seem to be having a competition to see who can be louder. The one party is at the same place as last week, I think two properties away from us. Word on the street is that some “young people” are trying to start a makeshift discoteca there. You might be wondering if there are zoning regulations or something against that sort of thing… and I’m wondering the same thing. This can’t be legal, right? On the other side, our immediate next door neighbors are having a party, and the music is so loud that we could just have our own party here using their music. I’m not even exaggerating when I say that I think they’re trying to outdo each other because the music on both sides has gotten progressively louder since the beginning of the night. HOW AM I SUPPOSED TO SLEEP??? I have ear plugs, but I hate sleeping with them in and my ear canals are so small that they always fall out. UGHHH. Get ready for a grumpy Lara tomorrow.